360° filming is a complex affair and needs careful planning, camera placement, lighting and talent rehearsals. It is is typically recorded with a multiple camera rig or a dedicated camera that includes multiple lenses embedded into the camera. During post production the recorded footage is merged into one spherical video through a method called stitching. The colour and contrast of each shot has to be calibrated and synched with the others. The result is an impressive video similar to virtual reality set ups. One of our favourite DOPs, Harald Capota, has recently completed several projects with some beautiful and astonishing imagery for Germany’s mega broadcaster ZDF. He gave us some insight into this project by answering a few questions on 360 degree filming. Harry please let us know how you prepared and approached this project? First of all we spent a lot of time with technical site surveys and testing existing 360° ready-to-shoot camera systems, but their image quality did not impress us. We chose to build our own rig consisting of 5 DSLR cameras giving us a net resolution of around 12K. Since lots of scenes in our 360° documentary were supposed to take place throughout history, I intended to light them as naturally as possible and according to the specific location and era. How many cameras did you use and how were they synchronised? Our rig consisted of 5 DSLR Sony Alpha 7SIII cameras equipped with identical 8mm lenses from one batch. A 6th camera was used to shoot the bottom plate (bottom part of the sphere, usually where the tripod stands). An engineer “hacked” the cameras and built a remote control for adjusting exposure parameters for all cameras simultaneously. Since these cameras had no time code, we played a 1-frame long acoustic signal, when rolling the cameras in order to sync them in post. How can you set lights when everything is visible? The main priority was using natural available light sources, so choosing the right time of the day to shoot was key. Secondly I asked the set decorator to include light sources into the set, e.g. lamps, torches, fireplaces. Whenever necessary I placed regular lights in the set trying to hide them as much as possible behind corners, walls, or set elements. Sometimes they were visible through some of the lenses but we shot a clean plate for every set, removing the faulty parts in post production. There were scenes which were shot with a locked off camera only using some parts of the frame and stitched back together in post. The invisible unused parts were used for lighting as well. How did the technology of 360° photography advance from when it first started? As technology evolves, future 360° camera systems are becoming increasingly better – image quality and performance wise. They deliver higher bit rates, higher sensitivity and higher definition. 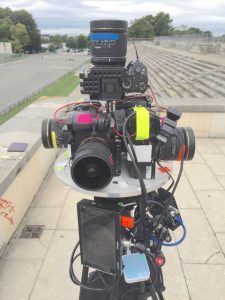 There are compact, lightweight, ready to shoot camera systems, sometimes with just two lenses and – very importantly: easy to setup and trigger, behaving like one regular camera instead of 5 individual ones. Today they are already able to stream out a roughly stitched 360° preview wirelessly. What would you recommend to producers who are considering shooting 360 degree video? Shooting 360° video means you have to block of roads in all directions, also from a distance while the crew doing this has to be hidden as well. Sets have to be decorated or cleaned all around not just for a specific perspective or a narrow angle. Postproduction will be more work-intensive, since we are dealing with higher definition than 4K. Also, stitching will take its time to tweak and fine tune the video. Nevertheless 360° films represent another facet of film making. 360 degree video is not meant to replace conventional films but rather offers a new experience and perception in storytelling. They demand a viewer willing to look around and discover their world!